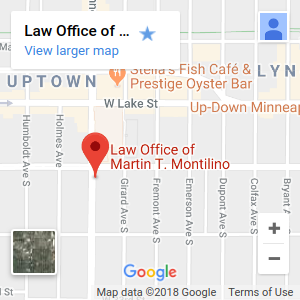 Martin T. Montilino (E-mail: martin@uptownlawyer.com) is a graduate of Hamline University School of Law and was admitted to practice in Minnesota in 1991. He practices in the areas of personal injury and workers’ compensation and he is a member of the Minnesota and Hennepin County Bar Associations as well as the Minnesota Association for Justice.Martin’s practice involves trial work in the Minnesota District Courts. He was the recipient of the Robert Linn Levine Memorial Scholarship at Hamline University in 1991 as well as the American Jurisprudence Award in 1989. He authored “DNA Testing, Use and Admissibility in Minnesota Courts”, 11 Hamline Journal of Public Law and Policy, 1990. A personal injury lawyer can help you fight for your rights. An accident can have a huge impact on you and your family. Victims of personal injury and their families often face unique challenges. The cost of medical bills following an injury can be difficult to manage, and the cost of rehabilitative care that allows people to get back on their feet can put great financial strain on many households. The Centers for Disease Control reports that 2.5 million people are treated in emergency rooms due to car accidents. The economic cost of these hospitalizations is immense. Lifetime medical costs due to automobile injuries in 2012 cost more than $18 billion. The CDC estimates that the earnings lost due to these injuries is around $33 billion. Many motor vehicle accidents could have been easily prevented. Distracted driving, DUI, and other factors can lead to debilitating injuries. Fortunately, the law offers remedies for individuals who have been injured in an accident. A personal injury lawyer can help you fight for your rights, seek reimbursement for medical expenses, and lost wages. Our law firm is aggressive, hard-working, responsible and reliable. Contact our firm to arrange a FREE, no obligation consultation today. We guarantee you will receive fast and reliable client response. If you need a car accident attorney or personal injury lawyer, I will respond quickly to your address your needs and concerns. Your case will be thoroughly reviewed prior to any type of litigation, and our promise is to evaluate your situation carefully without making undue promises. My primary objective as an experienced accident attorney is to be fair and honest concerning each individual claim. After reviewing your case, I can let you know whether litigation or negotiation is a prudent course of action. I can also help you determine how much your case is worth, by evaluating comparative fault, and reviewing your expenses, life-style changes, and pain and suffering. It can often be difficult to determine how much a case is worth without the help of a lawyer. I’ll take the time to carefully review your case and offer a realistic assessment. Our main area of focus is to provide professional personal injury assistance to our clients throughout the Minneapolis and Twin Cities region. Whether you need an experienced accident attorney or workers compensation lawyer, you will find that our law firm is aggressive, hard-working, responsible and reliable. Whether it’s in a courtroom setting or otherwise, our success depends on your success. If you would like to discuss your case, please contact me personally to arrange a FREE, no obligation consultation today.